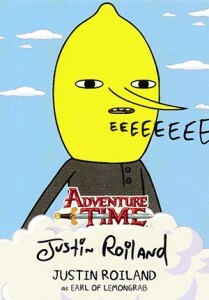 If you haven't watched Adventure Time yet, you probably don't know that it's one of the strangest shows to hit television is, well, ever. 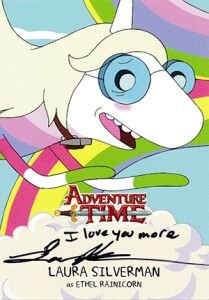 But that's the charm. 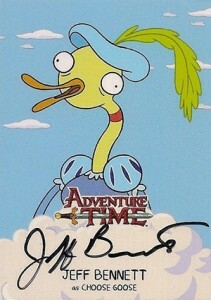 Through weird characters and imagination, it takes a post-apocalyptic world and makes it fun. 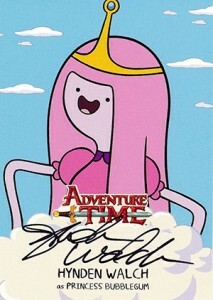 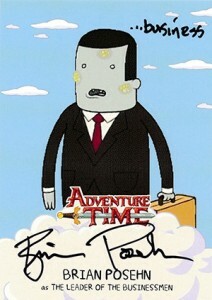 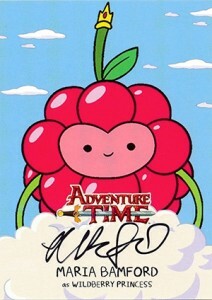 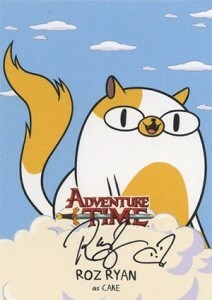 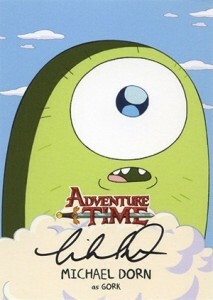 The 2014 Cryptozoic Adventure Time Autographs take a similar fun approach, offering signatures from a variety of the show's cast and guest stars. 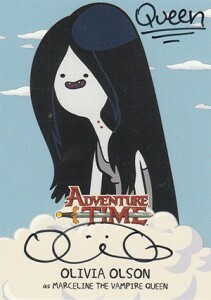 Inserted one per 2014 Cryptozoic Adventure Time box, the set has 20 cards. 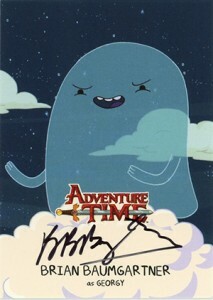 Right away, fans of the show will notice that Finn (Jeremy Shada), Jake (John DiMaggio), BMO (Niki Yang) and Ice King (Tom Kenny) are absent. 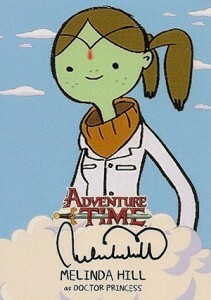 These may be the lead characters in the show, but there are plenty of others to fill the list. 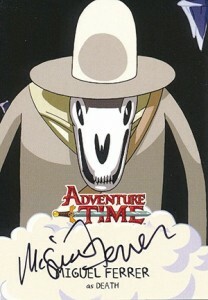 Among them are some bit characters voiced by notable actors known for their work outside Adventure Time. 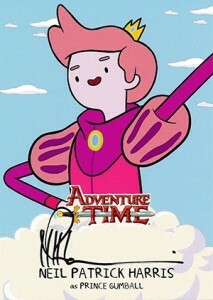 Topping this list is -- wait for it -- Neil Patrick Harris, known most recently for playing the scene-stealing Barney on How I Met Your Mother. 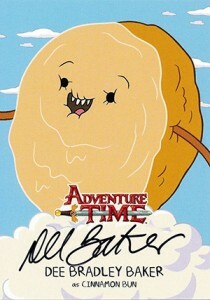 There's also Erik Estrada from CHIPS and Michael Dorn from Star Trek: The Next Generation. 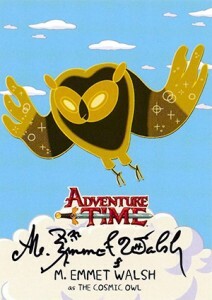 If you're looking for a unique signature, M. Emmet Walsh, a great character actor from Blade Runner, Fletch, The Jerk and more. 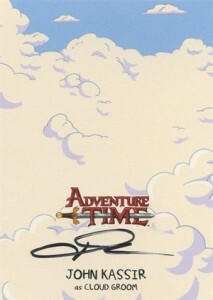 Select 2014 Cryptozoic Adventure Time Autographs can be found with notes and inscriptions added to them. 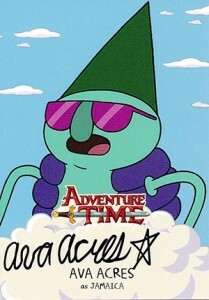 Multiple signers did these on some of their cards, including Justin Roiland (Earl of Lemongrab), Laura Silverman (Ethel Rainicorn) and Brian Posehn (leader of the Business Men). 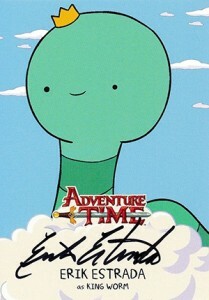 Check out a full gallery of all the 2014 Cryptozoic Adventure Time Autographs below. 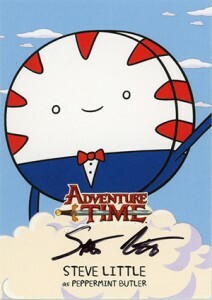 If you have a favorite character or are looking for a specific card, click on the link or image to shop for singles on eBay.